toor dal recipes. toor dal Indian recipes. From sumptuous preparations like the Punjabi dal tadka to the basic toor dal, snacks like mixed dal handvo or pulse appe and sweet treats like puran poli, toovar (arhar) dal is the most widely-used form of lentil in India. It is a rich source of protein and a versatile ingredient found in most Indian households. Arhar dal or split pigeon pea is generally soaked and cooked. Apart from protein, toovar dal also provides many nutrients our body needs such as iron, folic acid, calcium, magnesium, potassium and B vitamins. An aromatic, flavorful onion-tomato masala is the base of most dals tempering. Cooked toor dal is added to it and simmered with a dash of sweet and sour agents like jaggery, lemon juice, amchur or tamarind. You can add a punch to this simple preparation by adding spinach. Punjabi Toovar Aur Palak ki Dal and Palak Toovar Dal are mouth-watering delights brimming with nutrients. A wholesome combination of vegetables and multiple dals to make the Subzi Dal, not only has an interesting texture but also, an outburst of flavors, thanks to the wide range of ingredients. If not vegetables, you can simply combine a myriad of dals to make the Panch Ratani Dal and Teen Ratna Dal with a pour of aromatic tempering. Dal Moghlai and Masalawali Toovar Dal are other flavorful and easy preparations that make a delectable accompaniment for parathas and rotis. Gujarati Toovar dal, a sweet and sour version made with toovar dal, jaggery and tomatoes can tickle your senses and palates. It is made on a regular basis in most Gujarati households and served along with bhaat (rice), rotli and shaak. Add a festive hue with an addition of ingredients like peanuts and yam to make the traditional Gujarati Dal. Osaman with Gujarati sukha moong or Lachko Dal is a traditional lunch menu. Trevti Dal and Bhatia Kadhi are other interesting Gujarati preparations that can be tried when you are bored with the routine preparations. One-pot meals like Ek Toap Na Dal Bhaat, Toovar Dal ni Khichdi and Dal Dhokli are other popular Gujarati delights. These meals are not only nutritious and interesting but also, satiating even when they make use of common ingredients. Dry spice-mixes like Homemade Rasam Powder and Sambhar Masala makes use of toovar dal which is roasted along with a myriad of ingredients. They have a long shelf life and aid in the preparation of lip-smacking authentic food. While most dosa and idli batter is made using a combination of rice and urad dal, you can try your hands on unique delights like Dal and Vegetable Idli, Mix Dal and Rice Dosa and Adai. These snacks taste amazing with sambhar and coconut chutney. Other than this, Vaingya Ambot, Kerala Style Tomato Dal, Drumstick Dal are some tongue-tickling dishes that can be served with rice or Pongal. Bisi bele bhaat, a traditional rice dish from Karnataka served piping hot topped with lots of ghee and accompanied by fried papads and a cool raita, is simply irresistible! 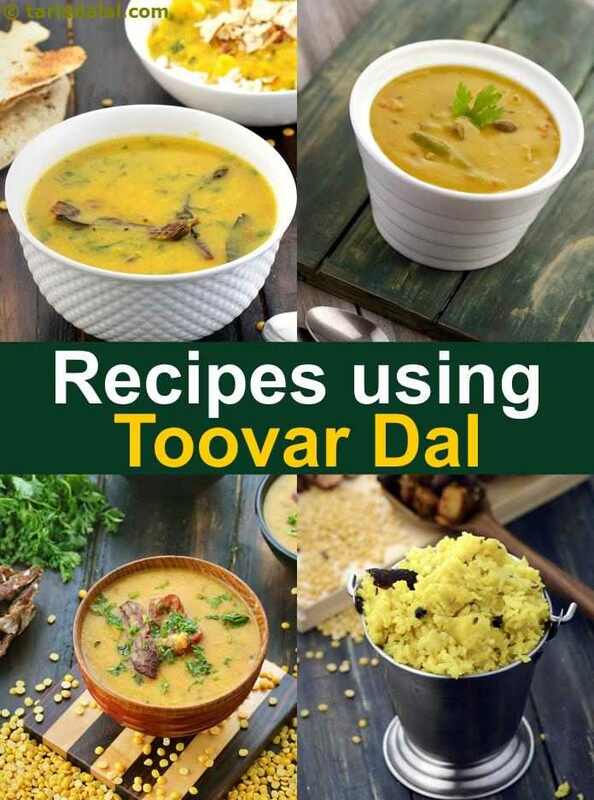 Our collection of 384 toovar dal recipes will surely have some unique and interesting recipes which you have never tried. Soya toovar dal roti, these unique rotis flavoured with garlic are a healthy combination of four flours – soya, jowar, wheat and toovar dal. Rich in proteins, calcium and iron, this one is a real star recipe!